When you invest a significant amount of money in a powerful gaming laptop, it is, of course, vital that you can keep it safe. Apart from general caution, a great laptop backpack is the best way to ensure nothing happens to your laptop. On this list, we have 12 excellent options as well as five budget alternatives. The Acer Predator laptops are usually pretty expensive, so it makes sense that the Predator backpack is held to the same standard of quality. Acer calls it the ”utility backpack” which makes sense as it provides you with a vast array of compartments, pockets, and straps for different purposes. It has all the large standard spaces for your laptop, keyboard, etc. But also has a ton of features for the smaller things, such as a dedicated strap for your headset and pockets for your tablet, phone, mouse, and so on. It feels incredibly strong in its build and comes with high-quality padding and water resistance. It is quite large compared to most other PC backpacks which make it excellent for LANs and other events where you usually need to carry more than just your PC. The Acer Predator Utility backpack is incredibly comfortable to carry and is definitely worth its price tag. If you value quality and comfort above all else, then this brilliant carry-on from Asus, Republic of Gamers is one of the very best. It has a beautiful classic looking design that will keep your PC and equipment safe and sound even harsh situations. It is designed specifically for Asus ROG laptops but can pretty much carry any 17-inch or smaller computer without any trouble. Despite having a lot of protection and padding, it is really lightweight and very comfortable to wear. It has a cleverly placed phone pocket on the front right strap, so you always have your phone on hand. The Nomad from Asus ROG might be a bit more expensive than most of our other picks, but it more than makes up for it in quality and comfort. The Lenovo Legion Armored is a fantastic budget option for those that want great protection for their computer at a very affordable price. It has a fully padded and waterproof space for your laptop but also comes with a whopping 16 individuals pockets and rooms for different peripherals. Making it the perfect LAN backpack as you can pack all the mice, keyboards, headsets and gamer equipment you might need. The design is classy but with a touch of gamer backpack to it and feels strong in terms of quality for its price tag. It is also quite comfortable to wear, and the additional belt strap will make sure it doesn’t bounce around too much. The Lenovo Legion Armored is definitely one of our favorite budget options that still offer a high level of quality and protection. Another popular and affordable option is the FreeBiz Traveler 18.4-inch laptop backpack. It has a pretty standard design, and while the padding is not as strong as in some of the more high-end models, it still provides decent protection for your laptop as long as you don’t throw it around. It has one large room for your PC and two smaller compartments for gadgets, supplies and other gaming peripherals. It is great to see a backpack in this price class accommodate so many different things, from dedicated phone pockets to small rooms for mice, tablets, etc. It can store laptops in sizes up to 18.4 inches and is specifically designed for Dell, Asus, MSI, and HP computers. The FreeBiz traveler is one of the best laptop backpacks for under 50 bucks, and I would recommend it to anyone looking for a diverse amount of compartments on a budget. This beautiful Dell backpack looks pretty spectacular and offers a lot of protection for your money. It has excellent foamed padding as well as an EVA molded front shield to keep your laptop safe from harm. It also has a deployable rain cover, so you don’t have to worry about bad weather getting to your computer or gaming equipment. It has a brilliant design that is created to provide unobstructed air channels for you back, so you don’t sweat excessively while using it in hot weather. Combined with the water resistance this means that you don’t have to worry about any type of weather with the Dell 50KD6. It has plenty of pockets for your gadgets and pc equipment but only one large compartment which can get a bit messy. So if you prefer to keep your things separated, then this is not the best option for you. This is an excellent gaming backpack for the price range, but the lack of multiple big compartments can be a bit annoying. This mid-range gaming backpack is an excellent option for people that are a bit overprotective about their equipment. It has full padding and a molded front to keep your laptop safe but also a power adapter bag that further shields your gear from scratches. It has three large compartments that allow you to keep your laptop separated from the rest of your peripherals and supplies which is always great to see. The padded straps make it comfortable to wear even for hours on end, and its design helps keep your back cooled. The base of the backpack is entirely water resistant which is to be expected from a mid-range gaming carry-on but good to see nonetheless. This Alienware backpack is one of the most protective in its class, and it gives off a real sense of quality. If you are a fan of Razer products, then you definitely want to consider the Razer Tactical Pro. It, of course, has the standard padded room for your computer but also a tremendous focus on protecting the rest of your gaming equipment. With a dedicated headphone pouch, scratch proof pockets for your mouse, keyboard, and even smaller things like webcams and chargers. It has a ton of rooms, and you certainly won’t have any trouble fitting in every last piece of equipment you might want to take with you. The design is a bit flashy in true Razer stile but without looking tacky. It has a green interior which makes it very easy to find what you need as opposed to the standard black that most other backpacks have. Razer is even so confident in this knapsack that they provide you with a lifetime guarantee when you buy it. The only negative I have to say about this packsack is that its padded PC pocket can only hold sizes of up to 17,3 inches. MSI makes some of the worlds best gaming laptops, so it’s not surprising that they also really know their way around designing a robust and reliable knapsack to keep it safe. The Urban Raider has one of the best looking designs out of any gaming backpack and comes in a comfortable, lightweight build that is easy on your back. It has all of the expected features such as full padding, water resistance and dedicated rooms for PC peripherals but nothing really beyond it. It is not a large backpack but can hold your laptop, keyboard, mouse, and headset without trouble. The MSI Urban Raider should be considered for it’s stylish, compact, and lightweight design. It doesn’t have anything out of the ordinary, but it nails the essentials. If you are serious about keeping your laptop safe and looking good while doing it, then this beautiful backpack from Everki is an excellent option. It has a dedicated, ultra-soft pocket for your computer which can accommodate as big as 18.4-inch laptops. It is also completely water resistant which can be essential if you have to walk far to work or school without worrying about your PC getting wet. While it’s great for carrying your laptop, it can contain a lot more and even has specific gadget pockets for stuff like your Ipad, phone, etc. Lastly, it is also incredibly comfortable to carry even when loaded with heavy weight due to the 5-point strap system. Which ensures it will lock firmly and comfortably onto your back. The Everki Titan is a fantastic laptop backpack if you want something qualitative to protect and carry your PC without looking too ”gamer-like”. The materials and build is pure quality and will serve you for years to come. Nothing shows you care about your gaming laptop quite like a quality Alienware backpack. We move on from multi-use options to one ideal for the hard-core gamer. Gaming laptops tend to be on the large side, and if you had read our review on the best gaming laptops, then you will know for sure that Alienware and SLI laptops are the largest of the lot. The Mobile Edge gaming laptop bag was designed specifically for this purpose. It has a multitude of compartments that allow you to store books and other accessories too. Perfect for when you are attending university and are heading out for a gaming session afterward. The most significant upside is padding, and there is indeed a lot of it. The only major downside we noted was with respect to the price. This is one of the most expensive bags on our list. The shoulder straps we felt could also be padded better to take on more of the weight proportionally. Sturdier zippers would also make this an unbeatable option indeed. A sturdy and safe pick, with excellent padding and highly multifunctional. If you just went past the Alienware bag and were disappointed cause you owned an 18-inch laptop then not to worry. The Bonvince backpack will have you covered. This large laptop backpack with its water-resistant design is also a more affordable option on our list. This is also a great option if you have multiple laptops or are into the habit of upgrading quite frequently. The bag has all the usual bells and whistles that hold accessories. The computer compartment is padded reasonably well. The major issue we had with this backpack was with respect to the shoulder straps. This bag is indeed big which in many cases means you will be carrying a lot of items. The straps must be able to handle the weight, and this is where the bag falls a tad. During constant use, the straps seams do seem to suffer. The 2nd round of stitching we felt would have don’t this bag wonders. Nonetheless, a good option provided you stick carrying your laptop and just a few other things. We feel this is the laptop bag with the highest value for money on the market today. The case logic is something we consider as one of the best gaming laptop bags in the market today. It even fits the MSI GT80 TITAN SLI which is one of the largest laptops in the market today. So if you are looking for a cool bag to help take your rig to your friend’s place for a gaming session, then this is it. The neutral design makes it great for the office environment as well. The bag as you can tell by now is exceptionally spacious and has compartments for different accessories like pens, iPods and more. The bag sturdily build and is extremely affordable for such a large option. The zippers are great, and the material holds well against abrasions as well. The case is quite lightweight, and this is where performance wise it is lacking we felt. The padding is slightly on the skimpy side, especially as the compartment is large and the edges of smaller laptops are not always aligned with the corners of the bag. The upside is that if you are looking to fit some spare clothes to work, then this bag will certainly do the job! Not everyone can afford a quality knapsack for their laptop and have to make do with affordable alternatives. Luckily, there are some decent options out there for people on a budget. One of the most qualitative budget options for sure. The Evecase is the first on the list which is a Unisex messenger/ convertible shoulder bag. Unlike the other bags, this is slightly on the larger side and can be converted. It is ideal for both men and women. However, we felt it performed better as a shoulder bag as it was on the larger side for a messenger bag which can make it a bit awkward. The core functionality is excellent with good padding and sufficient space for some if not a lot of accessories. The bag is not perfect though with the zipper not being smooth and the color which is far less rich than advertised. Despite its convertible functionality, it does not include a long strap. For what it has to offer in terms of functionality we thought the bag was slightly on the expensive side. The pockets are well designed to use in shoulder bag mode. Overall, an excellent and very affordable unisex option for travelers & office goers alike. An immensely popular choice for those looking for a sufficient laptop bag with incredible value for money. The Amazon Basics is an excellent option for those looking for an inexpensive cover for your laptop or even tablet. The external material works great against abrasions, and the zips are extremely well-built also. This computer bag is available in many sizes that suit everything from your tablet to a massive 17.3-inch gaming laptop. We’ve reviewed the 15.6-inch version here. The design of the bag is quite good with two zips where you can place other items and accessories. The features of this bag are not all rosy though. We didn’t quite like the padding it offers. Unlike other more expensive models in the market, the filling is minimal so while this bag can protect your device from basic things like dust and a small drop, don’t expect it to protect against heavier falls. Some users also reported durability issues with regards to the shoulder strap too. Nonetheless, this is an inexpensive and useful laptop bag for folks. A versatile laptop backpack, that is both water-resistant and has a USB charging port. Surprisingly it is also very inexpensive. The Mancro laptop is the first on the list that boasts a water-resistant design. Unlike the basics which we saw earlier this is a backpack. It has several cool features too. We liked the fact that this one size can accommodate any small to a large laptop. It can save you a lot if you happen to have multiple devices or different sizes. The USB charging port is also a neat idea; however, the inside is poorly executed as there is no immediate room for a power bank or battery to be placed. 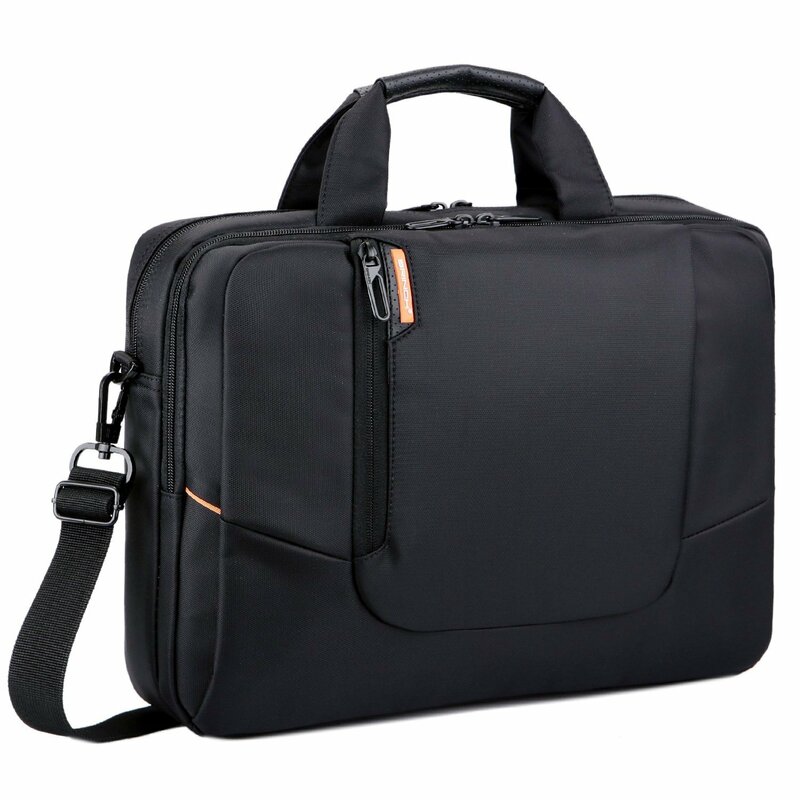 This laptop bag is ideal for business travelers in particular and can save you from the accidental water spillage too. The bag is made from polyester which can have a bit of an odor on the purchase. This can be removed by airing out the bag initially. The anti-theft feature really divides our opinion as the lock is a nice touch, but it’s not quite sturdy. The zipper design could also be a bit better we felt. The significant upside of this backpack lies in how spacious it is. It can accommodate all sorts of accessories from sunglasses to your chargers. This is a great thing to have that other more compact designs fail to offer. An aesthetically pleasing and highly qualitative shoulder bag for the price range, ideal for laptops, notebooks, and pads. The CoolBell is quite similar to the Amazonbasics bags with the shoulder strap and the hand strap design. The build material is something that differentiates the two bags. The Velcro finish is a nice feature. This bag will fit anything up to a 15.6-inch laptop. The padding is also quite good with the added advantage of water resistance. You can confidently walk through the rain and not worry about your electronics getting soaked. A cool bag to have especially if you live or travel to places like Melbourne or the UK where it can rain a lot. There are roomy compartments that can hold other items like pens, phones, and even some clothes too if you have some really lightweight wear. Likely one of the most secure laptop bags on the market, offering great padding and safe space for all your devices. The Brinch is one of our favorites on the list. This waterproof bag is one of the few on the list that offers amazing padding on all sides. It is definitely one of the most well-padded of our budget picks. The compartments are neatly organized, and the outer layer is not just water-resistant but waterproof too. The feel is quite sturdy. The one thing which we didn’t like is the seam where the shoulder strap meets the bag. This issue was reported by other users too. The belt needs to be reinforced so that it does not tear off easily making it one of the most durable and functional options on our list. You can store everything from pens books, CDs, earphones, phones and tablets in a very organized manner too. Ideal for when you are making presentations in a work environment also. This bag is available in multiple sizes as well which can suit gamers too. A list of steps we go through when testing out these bags. A laptop bag is first and foremost made to carry your things. So it is essential for us to make sure that the container has some decent weight capabilities. We do this by filling it to its utmost limit, with all the heaviest computer equipment we have at the office. Usually, it ends up being around 70-80 lbs, depending on the bags spacing. Then we hang it up on a rack for 48 hours. This is a fantastic way for us to determine if the bag is capable of carrying a heavy load, without strain. Even Though you probably won’t expose it to the same amount of weight stress, it is important to test. Since any quality bag should be able to deal with this weight capability test, and it allows us to rule out the bad ones. It is also a great way to see just how much space a bag has and how easy it is to fit a lot of equipment in it. This one is just a continuation of the weight test. Since the heavy load, we use in the weight test is the ideal way to test the comfort of the bag. Because we test it when the bag is at its heaviest we make sure that we will notice if it has any comfort issues. This test includes us taking a 2-mile walk and bike ride, wearing each bag. So if the bag is uncomfortable or bad for your back or something of the sort, we are sure to find out. This is all about exposing the product to hard and immediate stress. Such as throwing it around, tearing it, putting it under water, etc. All of this is done to test the overall durability, but maybe more importantly, the padding. It is crucial that every bag can protect the electronic devices inside. This is the big difference between a regular backpack and a laptop bag. It usually has a lot more important and expensive things to protect, meaning that the padding has to do a good job. This is where our ”Acer Aspire One testing dummy” comes into play. During every padding and durability test, this is the laptop that we put into the bags. As you might be able to see, it has been through a lot. While it is far from being in mint condition, it has survived all of our tests with the backpacks on this list. Which mean that your laptop should have no issues since you really shouldn’t treat your computer as we treat our testing dummy. Obviously, this does not mean that every kind of laptop will survive being thrown around in these bags. But it is still quite the testament to their padding quality. No matter how many tests we run, your personal needs are beyond our control and are something you should consider before buying. These are the things that you should consider with yourself before making your purchase. Depending on what you need the laptop bag for, different things are important, which is why we have tried in our reviews to state if we recommend it for office, gaming or versatile multi-use. Office: Getting a laptop bag for office use generally set higher standards for the appearance, more than anything else. You want to send a professional signal, all the while keeping your stuff nice and safe. Quality fabrics, classy design, and versatile spacing are usually the trademarks of a great laptop bag for work. Gaming: This is where padding and spacing are more important than looks. Gaming equipment is expensive and should be treated as such. This is why proper protection for your gear and enough space to carry it around are probably the most important for a gaming backpack primarily if you want to use it for LAN parties and such since that will mean that you need to carry your keyboard, mouse, computer and more, which require a decent amount of space. All-purpose bag: This is the nice mix of it all. If you don’t just want to use your backpack for your laptop, but you also want one that does a good job as a fitness bag, traveling, etc. This one doesn’t require as much padding as a gaming bag or as classy a look at an office one. However, it does need a decent mix of it all, durability, padding, spacing, comfort and so on. Just as it is with almost any product in any category, your budget matter. We feel that have a small budget is not necessarily a hindrance, as long as you learn to adjust your demands accordingly. As an example, if you only have 500 dollars, you cannot expect a good gaming laptop. The same thing goes with laptop bags, and if you have a small budget, it is crucial that you adjust your expectations to that budget. With almost any piece of gaming gear and PC equipment we have tested, there is a decent budget option. It is no different with laptop bags.